The inventor who claimed the first U.S. car ever sold recalls the birth of the industry and the general public skepticism about automobiles. This article from the April 15, 1911 issue of the Saturday Evening Post was featured in the Post’s Special Collector’s Edition: Automobiles in America! In 1930, Alexander Winton, by then one of the legends of the auto industry, wrote this article for the Post about the wild early days when even promoting the idea of a self-propelling machine would make you the object of ridicule. Winton was a bicycle maker, and as he writes below, he soon became infatuated with the idea of a bicycle that “a rider wouldn’t have to push and keep pushing.” In 1896, he founded the Winton Motor Carriage company, and soon began turning out cars at the dizzying rate of four per year. He would sell his first car in 1897 — arguably the first automobile sold in the U.S. — for the princely sum of $1,000. There has been much argument as to who made the first automobile in this country. My own conviction is that the honor belongs to Charles E. Duryea. I began serious experiments in 1893, and I am sure Duryea was conducting them prior to that year. But whether Duryea built the first automobile or whether he didn’t, the fact remains I built, and sold, the first American- made gasoline car. The exact date of the sale was March 24, 1898, and about a week later — on April 1, 1898 — I received payment and shipped the car to its new owner, Robert Allison, a mechanical engineer of Port Carbon, Pennsylvania. I bought it back after Al- lison had used it a few years, and it is now in the Smithsonian Institution, in Washington. In the uncertainty of what the public would want, a great many strange contraptions were put together. Joseph Barsaleaux, a blacksmith of Sandy Hill, New York, built a motor horse. In his device, the horse moved on a single wheel about two feet in diameter, with the wheel attached to the shafts just as was a live horse. Reins attached to the mouth of the horse served as a steering gear, because the machinery was inside the horse and had to be regulated some way. The contraption weighed about 550 pounds, had a cruising speed of six miles an hour, and attracted some serious attention. In Washington there was a vehicle which gained its power by using compressed city gas. George Elrick of Joliet, Illinois, was busy with an engine having no wheels or gears and which manufactured its own gas as it went along. D.I. Lybe of Sidney, Iowa, was the owner of patents on a spring-motor device which stored energy running downhill and used it going uphill, while on level ground he claimed his vehicle would cover 2,000 feet at a maximum speed of 30 miles an hour. Compressed air and superheated water were to be employed by another company. At the time there was more money and in uence back of that idea than was behind all the gasoline-car manufacturers put together. 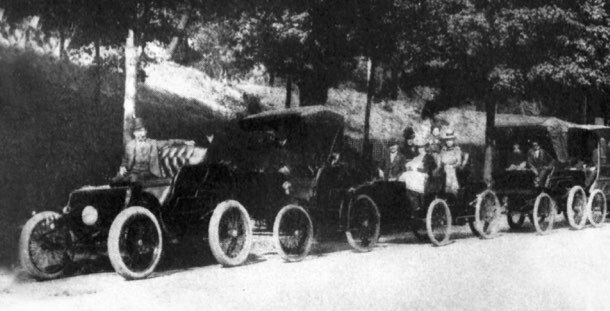 Cars with steam propulsion came in — not one or two but more than 100. Electric vehicles clogged the market, but in the end, public opinion turned to gasoline because it was clean, safe, and dependable. In spite of my banker’s displeasure, I went ahead with my model and finally had it in such shape that I thought it would run. All I needed to finish the job was a set of tires. I went to the Goodrich Company, in Akron, and told them I wanted something bigger than their biggest bicycle tire, something that would fit the wheels of a horseless carriage. “That’s a new one on us,” cried a man to whom I had been directed. They were single-tube affairs, and were pretty expensive. It wasn’t long before I got a puncture, and while I thought of patching the tire I figured out what I considered a better idea. Molasses was heavy and would stop leaks if they weren’t too large, so I began pumping it into the tube. I pumped too hard. The rubber gave way and the molasses came out too quickly to be dodged. 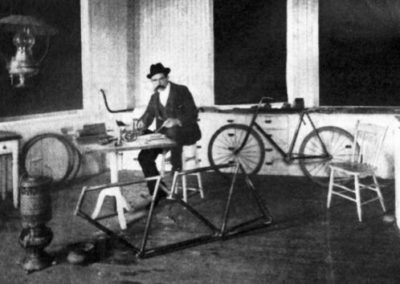 The tinkerer: Alexander Winton in the office of his bicycle plant in Cleveland, 1893. That first car worked pretty well, but I saw so many things wrong with it that I started another, using part of my bicycle factory for the work. I foresaw a future in automobiles and tried to interest some people in starting a manufacturing plant. Failing in that, I decided to go on a long trip, hoping attention would be attracted to the machine. He laughed at me. I sought another friend. Hatcher and I did not return by motor. We had blisters enough. You may wonder why, on this first trip ever attempted by an automobile over a long distance, we were able to complete a day’s journey on an average of six gallons of gasoline. The fuel was more volatile in those days, and we had a low-speed motor. The present high-speed motor uses a great deal more fuel, but it is a more adaptable engine for the needs of modern travel. In those days there were no gasoline stations, and the only place the fuel could be purchased was in a drug store. If, by chance, the druggist had a gallon of it, we were happy. Seldom were we able to buy in such a large quantity and usually we had to be content with a pint or a quart. But aside from generous newspaper space, the trip attracted no attention. I waited for months, but no financiers came to put their tall silk hats on my desk. “There it is” — and I jerked my thumb over my shoulder to indicate the machine standing in a corner of the room. I wasted no time in accompanying him to the machine and explaining its workings. “How many can you build and sell the first year?” he finally asked. Up to that time no company had been organized to build and sell a gasoline automobile. Not in this country, at least. So Metcalf became the first outside holder of stock in such a company. We did not know where our customers would come from, but we were sure they would come. We started building four machines, and when one was finished, Robert Allison, hearing that I was manufacturing automobiles, came to Cleveland. Within a short time we sold the other three machines, getting $1,000 apiece. Our profit on each was $400. By the end of 1898 we had built and sold 25 carriages, and this was such an amazing production that no one believed it. I had to publish a statement telling the names of the owners and when their machines had been delivered. We were beginning to show a return on the original in- vestment, to build a business, and to start a gigantic industry. Those were vastly different days in manufacturing to what we now have. We had no long lines of broaching machines, multiple drills, cylinder grinders; no endless chains moving along parts to points needed. There was little of the time-saving of modern manufacturing methods. We had to develop to meet those demands, and in starting off, our tools consisted of the standard drills and lathes, plus good mechanics. Every workman we had in those days was a good mechanic. He could not hold a job unless he was. He didn’t spend his days or his years putting on a nut here or a screw there. If we needed spark plugs, he had to jump in and make them. He had to know how to ream out a cylinder. All argument to the contrary, I believe American life has lost something in the passing of the good mechanic and the widespread adoption of the automatic machine. For one thing, men have lost much of their usefulness to themselves. But that is beside the point. He allowed as though I might be right. “You know I’m right,” I told him, and added I would send him blueprints of the wheel and gear I was using. He thanked me, but instead of sending him the blue prints, I boxed up a complete outfit and shipped it to Detroit. He found plenty of use for it. The steering wheel was one of my early patents, and it was the same wheel that came into later and general use. It is but one of more than a hundred patents I hold on different parts for automobiles. I believe I am entitled to say I have never collected a cent in royalties from them, nor will I. Lawyers have tried to argue me into bringing suits for infringements, but it so happened we pioneers always worked together. We loaned ideas. We loaned tools. We loaned patents. If we worked out a good idea, we loaned that. You see, some 20 years ago there was a man named George Baldwin Selden, a lawyer and inventor living in Rochester, New York, who caused a lot of trouble and expense to the automobile industry by bringing suit against all of us for the infringement of a patent that had been granted him on May 8, 1879. His patent covered a machine containing the essential principles of an automobile. He tried to interest various persons in his idea, failed for years, and then entered into an agreement with William C. Whitney, an Eastern capitalist, on November 4, 1899, under which he turned over exclusive rights to his idea. Whitney purchased control of the Electric Vehicle Company and then began a vigorous enforcement of his claims. The Winton company was the first to be attacked because it was the largest, and though we put up a vigorous defense, we lost the first court fight. We appealed the case and, while waiting to be again heard, entered into an agreement with other manufacturers to pay certain royalties to Selden and Whitney. For years Selden was in the courts, until, in January 1911, in the United States Circuit Court of Appeals, the validity of the Selden patent was upheld, but the defendant — the Ford Motor Company — was held to be not liable, because it was manufacturing a motor of a type known as the Otto engine, whereas Selden’s claims described one known as the Brayton type. All of us were following the Otto principles, so that decision relieved us of further contributions to Selden and his backers. But the unpleasantness of all those suits brought together the manufacturers for an exchange of ideas and mutual protection. I am still old-fashioned and believe it was a good thing. We made our own radiators. These cooling devices were nothing more than banks of tubes through which water could ow. During summer months, on Saturdays and after-school hours, we used to have boys come in and string square tin washers, with a jagged hole punched in the center of each, on the tubes. When the washers were all in place we would dip the tubes in solder so as to make them one part. We made our own carburetors. The first device used was a tube which went down nearly to the bottom of the gasoline tank. Air went through it, was forced into the gasoline, and when the impregnated mixture reached the top, it was suctioned off and passed through a valve between the tank and the engine, so the mixture would be made lean enough to be combustible. That contrivance didn’t work any too well, so we made a mixer which was an ordinary valve and pipe through which the gasoline could pass on its way to the motor. Out of the mixer came the present carburetor. In the one we built I had a hole punched in the bottom so the air could reach the gasoline. One day I received a frantic letter from a Brooklyn doctor who had purchased one of my cars. A few days later I was standing in his barn, looking at the machine, which, he said, wouldn’t run. I examined the gas tank. It was all right. I looked over the spark plugs. Tested the batteries. Got down under the car and stared up underneath. Everything seemed all right, so I went around in front and spun the motor. It was dead. Finally I ran my fingers under the mixer. Then I broke in on the physician’s sarcastic twitterings with this question: “Why did you plug the hole in the bottom of the mixer? It was my turn to be sarcastic. I punched another hole in the mixer, drained off the gasoline which had flooded the cylinders, put the fluid back in the tank, turned the crank, and started the motor. That was one thing we pioneers in automobiles had to do that presidents of companies miss today. We had to give personal service to our customers. Many times I have piled out of bed on a winter’s night to aid a stranded driver. A good many times, too, I left my telephone receiver off the hook so I could get some sleep. Batteries, so dependable now, were practically useless as they then made them. The battery was nothing but a receptacle holding containers, or cups, filled with the active acid fluid. These cups were made of carbon, and after a car had traveled a couple of blocks the cups were almost sure to break, spilling their contents and rendering them useless. He tried it and it worked. Worked so well that he o ered me a half interest in his business. I declined, although it would not have cost me a cent. I told him I was having troubles enough in the automobile business. That suggestion solved battery difficulties for a good many years and was really the beginning of the present storage battery. Nungesser later sold out to one of the big battery companies for an appreciable sum of money. Six pack: Alexander Winton, wearing a soft hat, is in the front seat with a group of his friends in front of the Winton Motor-Carriage Company in 1900. We made our own fans, our own differentials, transmissions, frames, brakes. I built the first two-braking system, and a Winton car was first to be equipped with internal and external brakes on the one drum. This was another of my patents, and it is only in the last few years that four-wheel brakes have taken the place of those I worked out. We built our own starters. We had an air starter that took the pressure from the cylinders, stored it in a tank, and kept it ready for use. This air starter was the forerunner, in a sense, of the present electric starter. It came about in a simple way. I was looking at a car one day when one of my men came along and began cranking it. The motor was cold and it was hard work. “Next year we are going to equip our cars with starters,” I told an associate, standing with me. “How can you do that?” There was doubt in his voice. I went inside, made a drawing of the idea that had come, built a mechanism that could be operated by pressing down a foot, and we had the starter. If there was orderliness in our shops, there was vast confusion in the fledgling industry. Not only did we have to fight all the time to get things done but after we had them finished we had to pitch in and fight the wildcat automobile companies on the outside. It was difficult for the public to distinguish between the genuine and the ephemeral, and there are towns that can still point to windowless factories that were built from the stock sold by glib promoters, but which never manufactured more than two or three cars. Orphan cars were numerous and always were a 100 percent liability, because it was impossible to get replacements for broken parts. The big accessory companies that now help the industry did not exist. Dishonest practices did much harm during years when support was most needed. 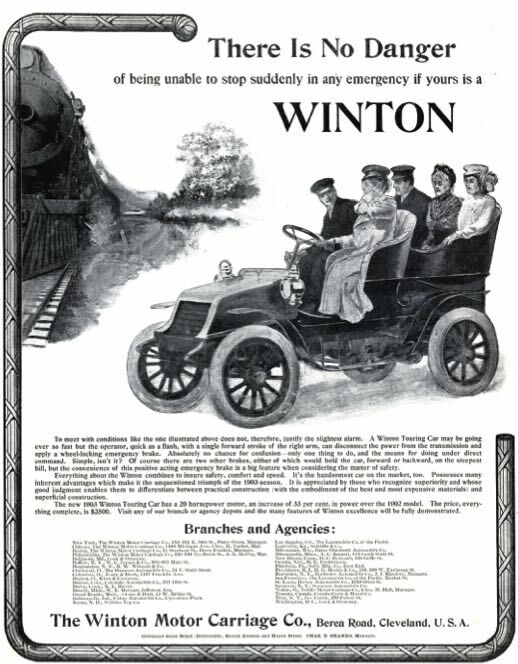 The orphan-car situation became so serious that the White Company — another of the pioneers — gave publication to this advertisement: “In a reserved and guarded way we have several times spoken of the desirability of purchasing a car made by a substantial firm possessing ample capital. In the last few months many concerns which have embarked in the manufacture of automobiles have discontinued, while others have withdrawn from actual business and their organizations have been scattered. When you know that more than 500 automobile companies came in and went out in those first few years, you will better understand some of the forces working against those of us who were honestly trying to succeed. We pioneers had to be conservative. We were trying to keep public interest, suddenly aroused, within reasonable boundaries. Aside from making cautious predictions, we had other diversions. Stirring word battles were fought in the greatest wilderness of all — the wilderness of terminology. Some wanted “horseless carriage” as a standard description; others recommended “polycycle,” “syke,” “motor wagon,” “motorcycle,” “horseless-carriage bicycle,” “road locomotive” — I guess there were a hundred names, but “automobile,” because of its easy rhythm, won out. Another thing we had to do which no president or executive of an automobile company of today would think of doing was to compete against each other on race tracks. Duryea, Walter C. White, Ford — we all used to race. That is how we attracted attention to our products. The public looked upon racing as a test of an automobile’s worth, and to a great extent it guided its buying habits by the results of the contests. I told him I’d put myself back in my own car and beat him any time he came on the track. The following day he announced: “I will never again be seen in a race.” Nor was he. Those were great days. Lots of hardships. Lots of quarreling. Lots of satisfaction too. No paved highways for automobiles to shoot along at 60 and 70 miles an hour; just country roads, filled with ruts, sand, and mud, over which no one wanted to drive at the maximum speed of passenger cars, which was about 30 miles an hour. But every trip was a different adventure.